What John Paul II wished to stress, and what is especially important to consider today, is that heaven is not to be understood in terrestrial terms. Heaven is primarily a state of being and is certainly not a ‘place’ in the worldly sense of the term. Nevertheless, we come to a difficulty when we ask: Where did Mary’s (and Christ’s) body go? The simplest answer is: Heaven! But then we wonder: If heaven isn’t a place in the ordinary sense of the word, how could there be real human bodies present there? The simple answer is: This has not yet been revealed to us. However, we can say that it is certainly not on earth. Neither is it within the earth. It is not in clouds either. Heaven may be somewhere in our universe, far off – though we must be careful not to fall back into our terrestrial categories of space, distance, and location. This argument from the Summa claims that, because the glorified body in no way relies upon the non-glorified world, neither does it need to be contained in the universe. Thus, the bodies of Jesus and Mary may in fact be outside of the universe, outside of space and time, no longer contained by place. There is no space or place outside of the universe, but this is where the bodies of Christ and Mary are; since they need not be contained by physical place. Therefore, it seems most likely that heaven is outside of our universe. It is not a ‘place’ as we usually think of ‘place’, but is a ‘non-containing place’, a ‘glorified place’. The glorified physical bodies of Jesus and Mary reside there. FANTASTIC - I have turned this over in my mind many times, not making much headway. The way you have explained it, and bringing Thomas' reasoning to bear, is a great help. Thank you. Are Enoch and Elijah with them? Enoch and Elijah were taken from Earth before the Crucifixion. They are not in the same condition of beatitude as Our Lord and Our Lady, but it is an interesting question as to whether they may be in the same "place". Even for natural objects governed by physics, notions of place (and time) have required serious modifications as the result of relativity and quantum mechanics. If our intuitions are not accurate for the natural, why should we expect them to accurate for the supernatural? Oh I invite you to Google the visions of Heaven by the seers of Medjugorje. Then things will be more conceivable for us earthlings. How beautiful Heaven must be. Most of my plans now are there. If only I would be allowed like St. Therese to spend much of my Heaven helping humans on earth. Of course, I first pray that I go to Heaven. Good question about Enoch and Elijah. I was thinking of discussing them when writing the post, but decided to focus exclusively on our Lady. St. Thomas stated that Elijah was in the "empyrion heaven"...the idea being that his body is not in the highest heavens. As Howard said, Enoch and Elijah are not in the state of beatitude...they do not yet have glorified bodies. Since they are not glorified, they cannot be in "uncontained place" in or "glorified place". Thus, they are not yet in heaven bodily, though they are spiritually in heaven, since their souls are in perfect happiness. They are still alive, that is, they have never died. So they still live something of a 'natural existence' -- it is a miracle, of course. Exactly where, Enoch and Elijah's bodies are is a great mystery...perhaps something for a future post. Don't forget Moses in the discussion of Enoch and Elijah. He appeared with Elijah on during the transfiguration of the Lord. "place". That is how at mass we are taken back to Calvary and present at that sacrifice. I like to think that God is with us always like the sun that lights our way on this earth so too God lights the way for the soul right now and for eternity...I'm hoping. This is just my own way of trying to make simple what is beyond my own understanding. St. Thomas' quote refers to "incorporeal things," I'm not sure that it applies in this context, since you are speaking about Our Lady's being assumed, body and soul together. Further, Q. 69 is specifically addressed to the question of where the souls go after death, preceding the resurrection - I wonder if the question does not apply to Our Lady . . .whereas the timing applies, as She assumed before the general resurrection, she did so body and soul together. Does St. Thomas speak somewhere else about the 'placeness' of Heaven? If Mary was taken up, dont you think one of the writers would have mentioned it? A pope just thought it up and everyone believes it. Jesus appeared to John and Paul after the crucifiction. Why didnt he mention that Mary is up there dispensing all grace? Or a co-redeemer? Why didnt Paul talk about a co-redeemer? Seems that would be a pretty big deal. It's interesting to point out that Catholic saints and seers since the 1st century AD have predicted that it will be Enoch and Elias who will return to earth in human form as the 'two witnesses' of Revelations 11:3-13. So logically speaking, as they were assumed into heaven, they can return to earth with a human body - perhaps because they have not experienced death. Although, this begs the question of how the bodies of Moses and Elijah appeared during the Transfiguration of Jesus (Luke 9:28-36). They were in human form speaking with Jesus, although they had not been raised from their tombs yet - at the point of Jesus' crucifixion and death - as all, or many of, the saints of the Old Testament were then. "Thus, the bodies of Jesus and Mary may in fact be outside of the universe, outside of space and time, no longer contained by place. There is no space or place outside of the universe, but this is where the bodies of Christ and Mary are; since they need not be contained by physical place. Therefore, it seems most likely that heaven is outside of our universe. It is not a ‘place’ as we usually think of ‘place’, but is a ‘non-containing place’, a ‘glorified place’." I must point out that space, place, and time are all man-made constructs, and all boil down to measurements of distance between real objects (eg, light years, speed of sound, etc.) These measurements help man's finite mind comprehend the infinite - God's universe, which is out of our comprehension completely. Therefore, heaven is a different realm but is within God's universe, which is infinite but not comprehended by man's finite mind. To all who have brought up questions regarding Moses and Elijah at the transfiguration, please look at this article I wrote earlier in the year: http://newtheologicalmovement.blogspot.com/2010/02/transfiguration-of-christ-part-ii.html. The simple answer is that Elijah was present in his living body, but Moses was either present in a temporary body or in his own body which was resurrected for the moment. In any case, Moses has died and is dead (his body is in the earth awaiting the resurrection); Elijah never died and is still alive (his body is hidden away by God, alive, awaiting the general resurrection). A pope did not just "think it up", it was the Christian people who have constantly believed that Mary was taken up. Their beliefs go back to the first centuries -- ever since the Apostle's saw her go up before them. In 1950, the Pope Pius XII issued the decree declaring the Assumption, AT THE REQUEST OF THE LAY FAITHFUL from around the world. As to why St. Paul didn't speak of it...it is obviously because he was writing before Mary herself was assumed into heaven! Where is heaven? The place of heaven is in God's heart. We are all aware that today when we say "Heaven" we do not refer to some place in the universe, a star or something similar. No! We mean something much greater, and something difficult to define with our limited human concepts. With the word "Heaven," we affirm that God, the God who made Himself close to us, will never abandon us, not even in death or beyond it, but has a place for us and grants us eternity. We are saying that in God, there is a place for us. . . . Our serenity, our hope, our peace, are based precisely on this: in God, in His thought and in His love, it is not just a "shadow" of us that survives. In Him, in His creative love, we are cared for and introduced with our whole life and our whole being into eternity. It is His love that triumphs over death and that gives us eternity, and it is this love that we call "heaven." Thanks for this great quote from Pope Benedict! What he speaks of is in full accord with John Paul II and St. Thomas, adapting the teaching to the modern world. Heaven is not a "place up there", like a star; it is something different, because heaven is the fulfillment of glory! I especially am intrigued that the Holy Father states that heaven is "not some place in the universe". This is precisely what I was hoping to stress in my article. It is beyond/outside of the universe. It is an "un-contained place" or what I have called a "glorified place". There, the bodies of Jesus and Mary dwell in glory! Us Catholics have been blessed with apparitions of the Blessed Virgin Mary who so lovingly has given us a shortcut to resolve issues we are wont to debate upon. She took the children of Fatima to a tour of hell, she took the children of Medjugorje to Heaven, Purgatory and hell. We have historical accounts providing details and these provide us reliable information n how it is in the afterlife, no matter how incomplete. There is a "place" for us after death, and it resembles, to some extent, our terrestrial location. The problem of Enoch and Elijah has always intrigued me and many others ( see above ). But I think C.S. Lewis pointed the way. There is no reason to doubt that there really does exist a Perelandra archtype somewhere in the bodily universe, and perhaps a nearly infinite number of such planets. It certainly would give greater glory to the creative power of God. And we do know that Elijah was taken up in a " firey chariot." What could be more poetic and practicle than for the beings of this Perelandra to have visited earth in their space ship and to have removed Elijah ( and Enoch) at God's command, so that they might pass the time until the " final days " in the company of beings who did not sin. She was brought to heaven and is by the right hand of her son Jesus. What is so difficult to understand? We have the trinity and the saints now in heaven (Mary is a saint). We all aspire to join them in heaven when we are raised up on the last day. You are correct in mentioning that the first quote from St. Thomas (q.69) refers to the incorporeal aspect of heaven. I used this reference because heaven is primarily an incorporeal reality. It would be wholly incorporeal except for the fact that the bodies of Jesus and Mary are there. The presence of their glorified bodies in heaven make it to have "place" according to the sense of a glorified corporeal place. Thank you for pointing out the context of the quotation! I hope you can see why I used it. The second quote from the Summa (from III, q.57) is more directly related to the bodily presence of Christ and Mary in heaven. I wonder if it makes any difference where the Mount of Transfiguration is? Is it Mt. Hermon or Mt. Tabor? Has Moses already been in the earthly Promised Land in a living body? "And there appeared a great wonder in heaven; a woman clothed with the sun, and the moon under her feet, and upon her head a crown of twelve stars." Rev. 12:1. A vision of our Holy Mother granted to John on the isle of Patmos c.95 A.D.
" In any case, Moses has died and is dead (his body is in the earth awaiting the resurrection); Elijah NEVER DIED AND IS STILL ALIVE(his body is hidden away by God, alive, awaiting the general resurrection)." To say that there is no account of Mary being taken up is dishonest as well as inaccurate. "There was need of her who in childbirth had preserved intact, be preserved incorrupt after death. There was need that she who had carried her Creator as a babe on her bosom, would linger lovingly in the dwelling of her God. There was need that the bride whom the Father had betrothed to Himself should live in the bridal chamber in heaven, that she who had looked so closely upon her own Son on the Cross, and who there felt in her heart the sword-pangs of sorrow which in bearing Him she had been spared, should look upon Him seated with His Father. There was need that God’s Mother should enter into her Son’s possessions, and as a Mother of God and handmaid, be reverenced by all creation." "From ancient times we have been taught that when Mary, the Mother God, fell asleep the whole company of the Apostles – except Thomas - was miraculously brought together in Jerusalem. Amid divine and heavenly praises they commended her soul into the hands of God and placed her body in a little tomb in Gethsemane. For three days a choir of Angels continued to sing above her tomb. And on the third day Thomas arrived. So that he could venerate the body that had given birth to Christ God, the Apostles opened the tomb. They found not the body of the Mother of God but the winding sheet and the most beautiful and sweet-smelling flowers. Mary’s body had been taken up into the heavens by her Son. Flowers were blessed FROM THE EARLIEST TIMES IN BOTH EAST AND WEST. Over time seeds and herbs used for medicinal purposes were also blessed, in commemoration of the many healings and blessings that were bestowed upon the pilgrims at Mary’s tomb." I think you do care about our beliefs, otherwise you would not be at this blog. I am astounded by people who claim to be Christian yet attempt to spread anti-christian doctrines and teachings using a book that was compiled and promulgated by the very same Church they claim is in error. As others have already responded to your comments, I will let your words remain. In the future, I will feel free to delete any comments which lack theological reflection. Doesn't a physical body rely on time and space in order to be what it is? It strikes me that a glorified body could not be physical in the usual sense of which we think of the word. Whatever"Heaven" is, wherever God is, I want to be there. Mary, who is the example for all womankind is there. Her appearances have been witnessed by a number of people in the last 200 years. In at least one occasion by hundreds at once. She was once physically touched by someone in Medjugorie. There was a physical resistance at the place on her gown where she was touched. I don't know that a spirit can do that. I believe in the assumption. I have hope in the resurrection and the glorified body, whether I understand it or not. Perhaps Heaven exists as another dimension or as a parallel universe to that of our material universe. Fascinating how St. Thomas' thinking must have been the inspiration for the imagination of many of the 20th century filmmakers! In any event, we are fortunate that the Lord has allowed His mother to reenter our dimension of time and space to remind us that our ultimate goal is to be part of the new heaven and the earth at the end of time. In fact, there are some good reasons to think that these apparitions are not of her true body, but are miraculous visions by which Mary is present in soul though not in body. Our Savior, for example, was not bodily present in the Divine Mercy visions...he will not be bodily present on earth until the final judgment. Likewise, I think it more likely that Mary is not bodily present in the apparitions, but rather makes use of matter to form a "body" for the apparition. This is just my opinion. Certainly, it is open to debate and other opinions are also possible. When Jesus in his risen, glorified body appeared to the apostles (Luke 24:36-43) we are told they were "πτοηθεντες" - alarmed, "εμφοβοι" - terrified, "τεταραγμενοι" - agitated, "διαλογισμος" -doubtful, "χαρας" - joyful, "θαυμαζοντων" - amazed. These are very understandable reactions to an event which was completley outwith any previous experience and totally beyond their immediate comprehension. 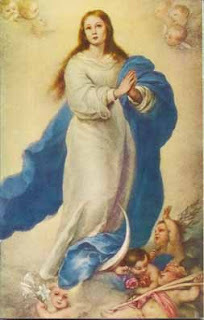 Similar reactions have been reported in those who have witnessed visions of the Virgin Mary. From this I think it is reasonable to conclude that the same spiritual phenomenon took place with the Virgin Mary - that after her death, her body was uncorrupted (as has been the case with other saints e.g. Bernadette of Lourdes)and that through the power of God she was assumed into heaven. As to whether the Virgin Mary is physically present during apparitions, I would say "as with Jesus so with Mary". I believe there is a similar pattern to the appearances of the Risen Jesus as recounted in the Bible and visions of the Virgin Mary as reported by many people over the centuries e.g appearance in a closed room (Jn 20:19), not being immediately recognised (Lk 24:17), hesitation among the visionaries (Mt 28:18) giving permission to touch the glorified body (Lk 24:39 & Jn 20:27) the apparition not being seen by everyone (Acts 10:41). Apologies for any mistakes in my Greek. Just started to try and learn some New Testament Greek and thought I would give it a go. Aquinas’ discussion about the place to which the Christ ascended at ST IIIa, q. 57, a. 4 assumes a Ptolemaic understanding of the nature of the Universe and of place within that universe. The Ptolemaic understanding is based on geocentrism. We now know that the Universe is not geocentric. The Ptolemaic model is false; and arguments assuming or based upon that model need not be accepted. Use of the Angelic Doctor’s comments about the Ascension in that article to determine the actual location of Heaven is ill-advised, given the cosmology they assume. Even a “glorified place” seems, according to Aquinas, to be a place in the sense of the area occupied by a body having quantity, if we are to judge from comments he makes elsewhere (see e.g. ST suppl. Q. 83, a. 5). This “glorified place” would, therefore, involve space. It would, without a doubt, also involve time, given the presence of creatures in Heaven. Father Garrigou-Lagrange, as usual, appears to take the question about as far as one should. The best that I can make out when reading about the post-Resurrected Jesus, is that there is no strict "continuity" to the physical body. He can appear at will wherever he wishes and, in the case of breaking bread on the road to Emmaus, he can vanish completely. It sort of makes sense of what Aquinas might mean by an "uncontained place". The body is no longer "contained" within the rules of physics. Is the body "no longer 'contained' within the rules [laws?] of physics," David, or are the physical properties of the glorified body no longer the same? Note that Aquinas ascribes some of the Christ's bodily actions after His Resurrection to the power of His Divinity, and not to the subtlety of His glorified body (see e.g. ST suppl. q. 83, a. 2, ad 1um). Point taken. Perhaps one could think of the Glorified Body as an actualization of all the possibilities inherent in matter. That would be nice! Thank you to all you have contribute to this discussion. How could Enoch and Elijah go the heaven if John 3:13 states "No one has gone up to heaven..."? A suggestion: http://www.learnthebible.org/john-313-contradiction-or-not.html Is it good? Elijah sent a letter years after his going to heaven according to 2 Chronicles 21:1, 12–15. How did he do that? Then this probably means that he did not go to heaven (in New Testament sense), just to the phisycal heavens? this enoch/elijah thing is great stuff to think about. a sci-fi novel written by a cs lewis/malamud/g.g. marquez awaits us i hope. After going through all the comments I felt the need to put in a few thoughts of my own. With all our reasoning capabilities, it would be impossible to comprehend what heaven would look like or where it could be. We are 3 dimensional, could any of us even visualize the 4th dimension? No matter how hard we try we just cannot. But we have our reasoning capabilities for a reason and that is to eventually work out our way into heaven. Science has of late given us substantial insight on our physical bodies and it affirms the church's teaching. Our bodies were designed to be perfect but have been corrupted over ages due to sin. In that sense we are born with defective genes which eventually leads to our death and is nothing but original sin passed down with more acquired along the way. As Mary the mother of God was born without original sin, it would be prudent to accept that her DNA was perfect a result of which would be immortality. If the Mother of God and other saints have been physically assumed, there could be a place in the universe they are or possibly not, the answer to this we will only have probably on our death. But having said that I strongly feel that a 3 dimensional physical universe needs a 3 dimensional physical interaction and the account given in the revelations only reflects the view of our universe through Gods vision which is not bound by the laws that he put in place. Please understand that this is only my point of view and not backed by any serious theological study of the catholic doctrine. I am a catholic and follow the interpretation of the scripture and doctrine as given by her and will stand corrected.